Our first of many school years with the boys in school. 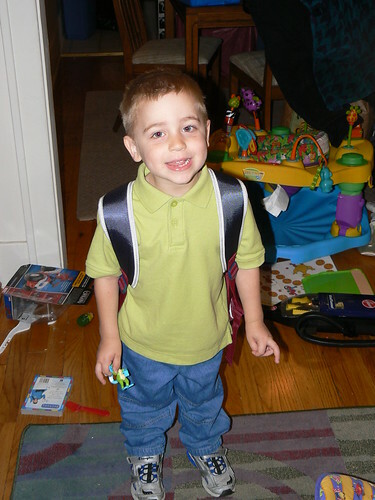 This morning was NHL’s first day of school – PreK here he comes! He actually slept all night and nearly flew out of bed when I told him it was school today. He got dressed, barely ate breakfast and was ready to go quickly. Last night I had his outfit all ready for the morning for easy dressing, made his lunch with his help this morning, and we were ready to head out the door at 7:45. Now please sit down. . . I am about to say something VERY shocking. Really, I mean it. . . especially if you know my husband. JL forgot to take the camera out the door.! *GASP* I fear he may be getting ill.
Hopefully he has a lot of fun meeting new friends and does well. I will update later. 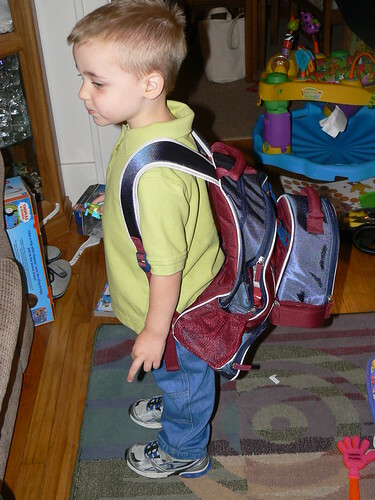 I still can’t believe my baby is 4 and started school today. I’m still trying to grasp the fact that I am not going back to school this year, it feels so odd. « Was there life before the ExerSaucer?